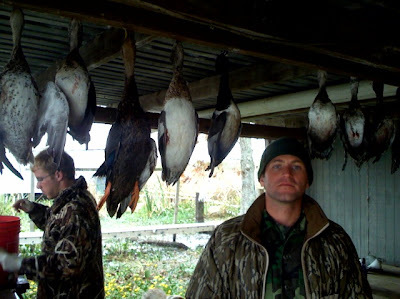 so while i have been down here in florida actually working for my ducks my buddy ryan was up in louisiana at his uncles hunting camp busting up the birds. 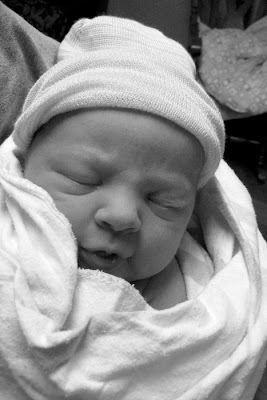 finn (closest i could come to naming him "fish") lewis kirby. i was called home during my class today because leah's contractions had gotten much closer and she felt like it was time to go to the hospital. 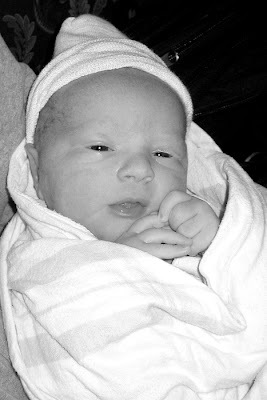 we arrived at the hospital about 5 pm and finn was born about 5:30 pm. he weighed 8 pounds 6 ounces and is 20" long which makes him a nice size keeper. we are thankful to the Lord that he is healthy and there were no complications. leah made some great duck soup on friday. so that means ive had duck two nights in a row. cant beat that. 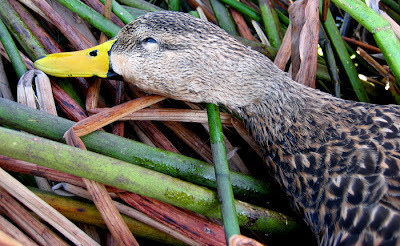 heres a recipe for some tasty soup that will help you make the most out of that duck. 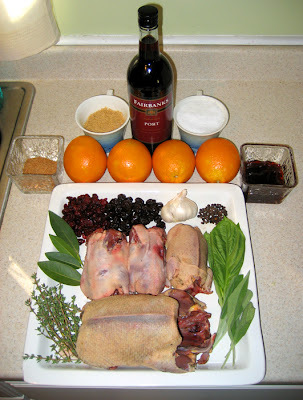 In a large pot combine duck carcasses (1 lg/3 sm) in water with onion, carrot, celery, garlic, salt, basil and bay leaves and bring to a boil. 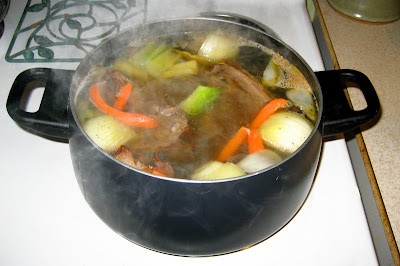 Reduce heat and simmer until meat is very tender and can be easily removed from the bone. In separate pot cook three cups of white rice. Remove duck from broth and set aside. Strain broth into another large pot and maintain cooking temperature at medium high. Pull meat from bone and add to broth. Chop celery and carrot and add to broth. 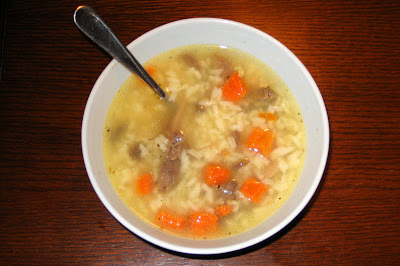 When rice is fully cooked add to broth. Season with salt and pepper to taste. Simmer together for thirty minutes before serving. 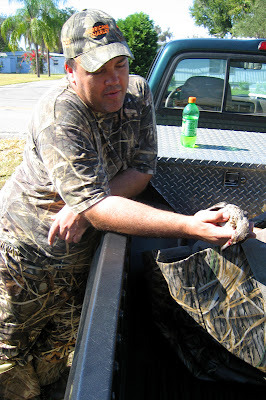 went hunting with quackbob from the florida water fowler forum today. 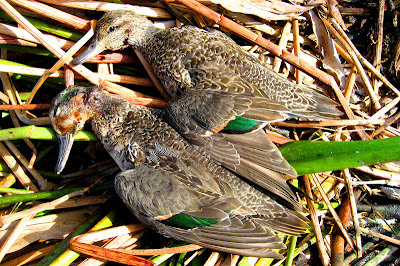 it wasnt a banner day but we managed to down two greenwings and have a good time. was nice to meet a new friend and future hunting partner. 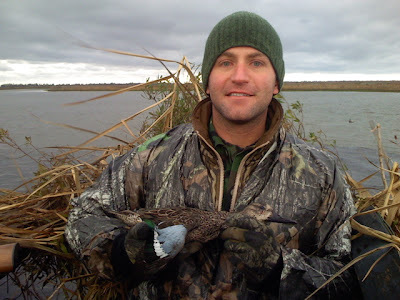 heres a pic of bob with his teal. 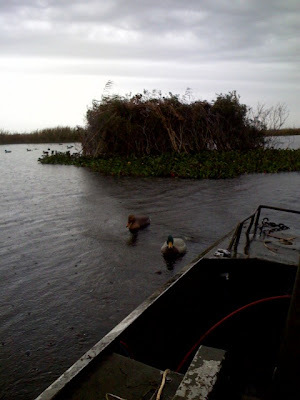 so for as long as ive been a duck hunter ive wanted to make it a tradition to hunt on thanksgiving morning. well after three years of begging and badgering leah finally let me go. (she has no idea the slippery slope she has started down.) two mins before "safe light" i had 5 mottleds buzz my head and land in my decoys. they dabbled around and the whole time I was saying to myself, "please stay, please stay" and after about a min. they got up and flew away. meanwhile, i could hear folks blasting away in the distance. while i was waiting for my next ducks the largest bobcat ive ever seen walked around on the shoreline. unfortunately, it was two dark to get a pic. then a few mins later i looked up and saw two bucks staring me down maybe 25 yards away. they didnt seem to be phased by the man with the gun sitting in the lake grunting at them in order to get them to look at his camera. not the best pic in the world but it is something. 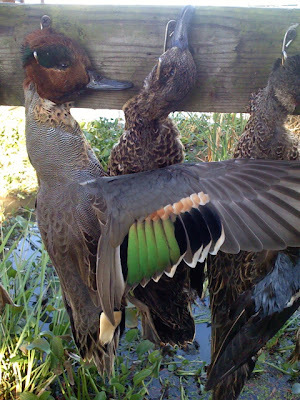 by 7:30am i had these two teal (one young drake and a hen). ten mins later i had two more come in. i got greedy and went after the drake (full plume) thinking that i might pick up the hen on the second shot which was a much closer and better shot. well i took two shots at the drake and flat out missed. live and learn! 30 mins later i dropped a mottled and he got up and waddled into the brush. after looking for him for about 20 mins i finally gave up. saw a few more ducks but nothing within range. had a blast! Add contents together in a large bowl. Completely dissolve salt and sugar in water. 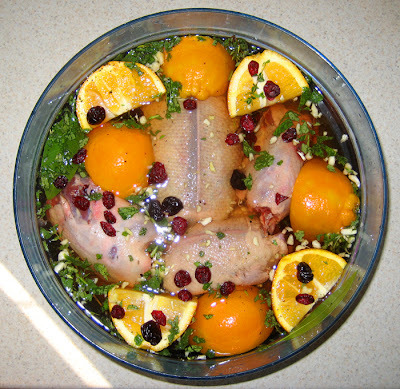 Completely submerge ducks in brine. Place in refrigerator for 24 hours before cooking. Melt butter in saucepan. Add port, jelly, vinegar and sugar; cook 2 minutes or until sugar dissolves. Stir in cranberries and cherries; cook 2 minutes or until slightly thick. Remove from heat and stir in salt and pepper. 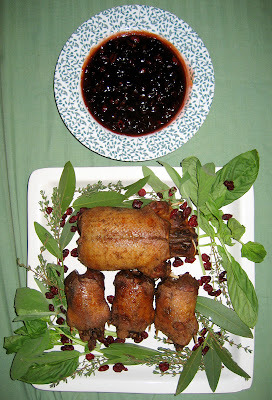 Dry ducks with paper towels. Rub ducks with Tony Charchere’s Creole Seasoning or favorite dry rub. Heat oil to 375 degrees. 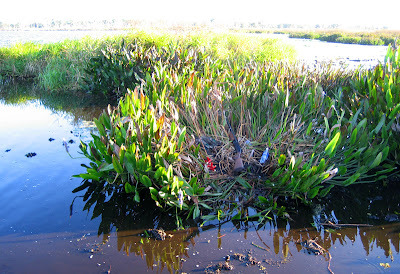 Submerge ducks completely, adding one at a time so oil can stay hot. Turn ducks over 1 or 2 times and remove after 8 minutes. 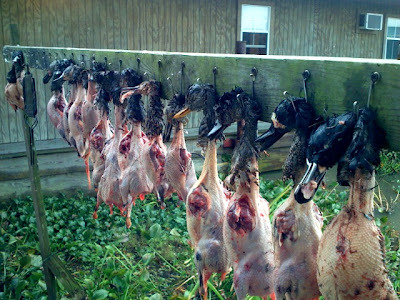 was getting my ducks ready for tomorrow and thought everyone might want to see whats on the menu. the top pic is of the ingredients for rub, sauce and brine. i will post the full recipe after i have pics of the completed meal. 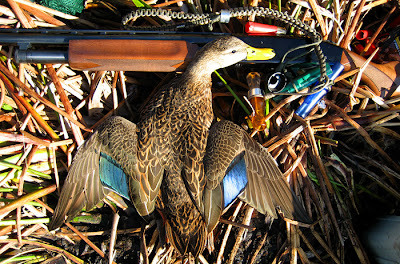 i went duck hunting this morning. it was not as productive as opening day but i had expected that since folks had been blasting the last two days. i did not expect three groups of birds to sneak up on me from the back throughout the morning. by the time i would see them, it was too late. i wasnt exactly on my game! 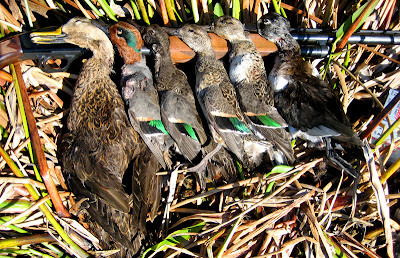 i should have bagged a woodie, a ringer and a teal. but today i seemed to always be looking in the wrong direction when the birds came in. 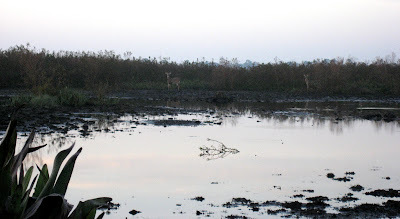 i was so frustrated with myself that i was ready to give up and go home but right as i was standing up to collect my decoys i saw a large duck over my left shoulder getting ready to pass. he was high but not out of my range. it only took one shot and rather than fall he took a long fast glide to the water. he hit the water on his stomach and skipped like a stone another 15 ft right-side-up across the surface and when he stopped he was dead. not so much as a twitch. it was a beautiful fall. he looked like a plane coming in for an emergency landing. one of the prettiest mottleds ive shot. bright yellow beak. 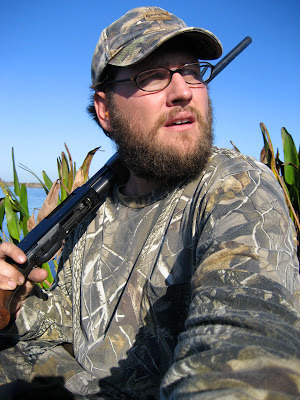 flawless dark feathers and not a shot hole to be found. maybe i scarred him to death? my arrowhead "look what i found" blind. looking out of my blind. 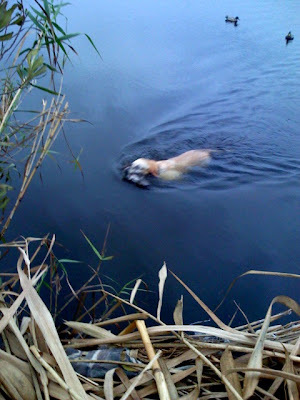 my "blind buddy" mista gator. he was a little shy so i couldnt get a good pic. he's in the middle. 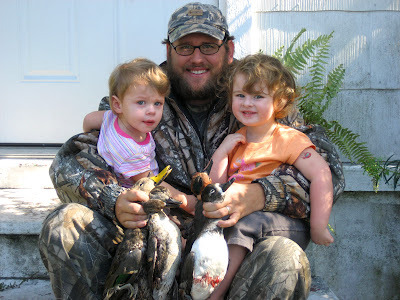 fern, lyla jane, ducks and myself. 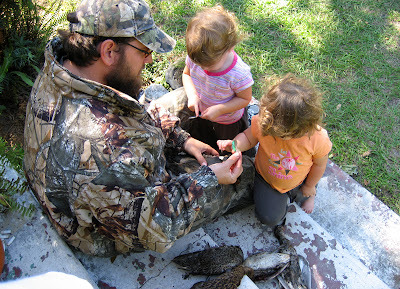 the girls checking out greenwing teal feathers. went to crooked lake this morning by myself because all my "pals" bailed on me. one of those perfect days. stepped out of my house this morning at 3:30am to a brisk 40 degrees. 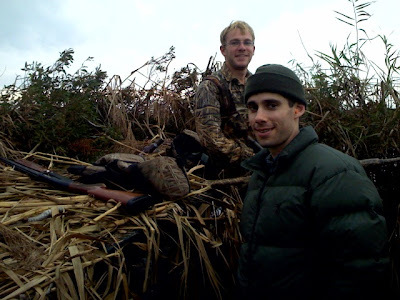 it felt like i was actually going duck hunting instead of going to sweat. 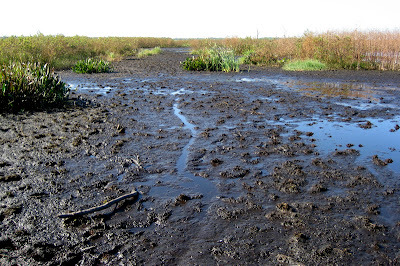 got to my first spot only to find a billion other duck hunters scrambling around looking for a spot. decided to go to a new spot that i had scouted earlier and not another soul. 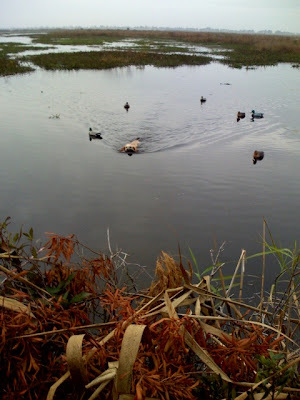 while setting out my decoys i flushed up about 50 ducks. 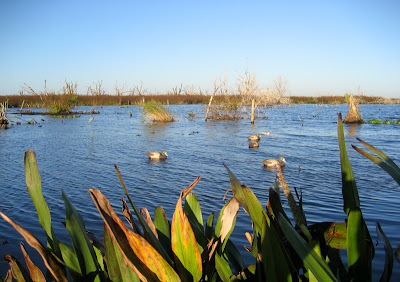 the folks that give duck hunters a bad name started shooting about 20 min too early like they do every year. 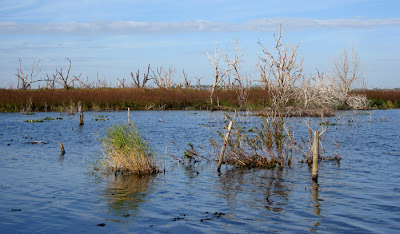 it took everything in me to wait as the ducks started swirling just above my head. 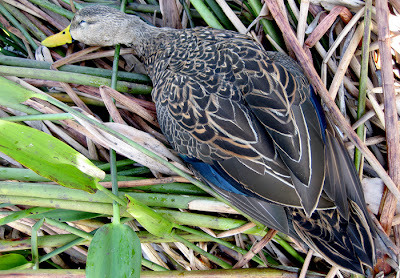 the first bird to fall was a mottled (drake) which i hate shooting first since you are allowed only one per day and i get real timid shooting at big ducks afterwards. 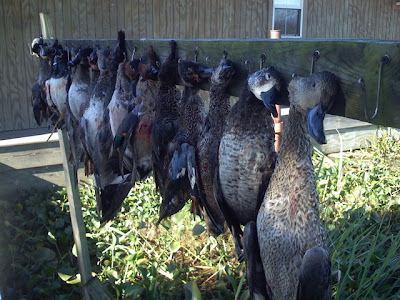 then greenwing teals (1 drake & 3 hens) (my favorite duck) who decoyed quite nicely. and finally a ringneck (drake). 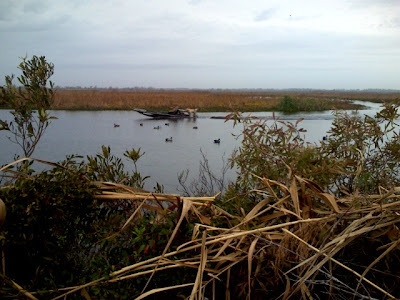 i also bagged 7 snipe (not pictured below because my camera died on me) after i got my duck limit. 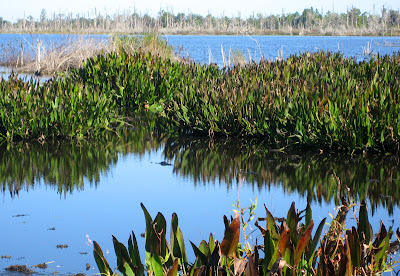 i saw: bluebills, wood ducks, a billion mottled ducks who kept testing me all morning long, several more teal who havent been on the lake the last two years and a gator who shared a blind with me most of the morning. it never got hot and nothing went wrong. it was one of those perfect days! they might not typically go hand and hand but today they did. vince and i had a tourney on lake alfred this morning. we took 2nd place and three prizes in the raffle. 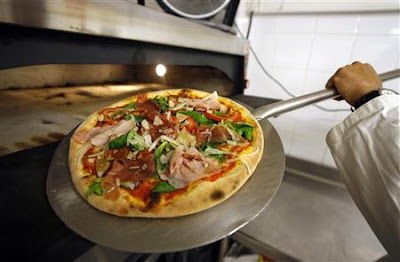 one of those prizes was a gift certificate to the "pizza connection" in auburndale. since the tourney ended at 1:00pm it was prime time for a pizza lunch celebration.